It's the middle of October and that means the North American fresh cranberry harvest is in full swing. Growers are busy harvesting and expectations are for a close to average yield, but down on last year's abundant harvest. 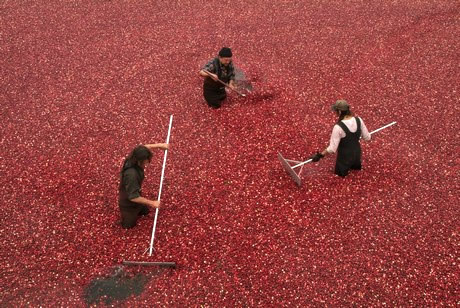 "The fresh cranberry harvest began in mid-September after a short delay of one week," said Parker Mauck, of Decas Cranberry Products in Massachusetts. "October is the busiest month and the harvest is reaching its peak now. We've had excellent weather in the lead-up to the ripening. However, in the early stages of the harvest, we had some cloudy weather and warmer nights which caused that slight delay." "In terms of yields, we are expecting it to be down around 10% on last year, which was an above average crop," Mauck continued. "Therefore, yield will be close to the long term average as will the Midwest region. Although marginally down, Massachusetts is faring better than other growing regions which are seeing larger declines. In other parts of the United States, such as Washington, Oregon and New Jersey, volumes look to be down in the order of 15%. Quebec, where the majority of Canadian cranberries originate, look to be seeing a decrease of 40%. However, this is coming off the back of several huge years there." The cranberry market is holding steady and growers continue to enjoy good demand, especially in the sweetened, dried category. Juice continues its downward trend while some international markets are looking favorable. "Cranberries are used in multiple sectors and we are seeing variable trends in different markets," said Michael McManama, CEO of Decas. "The juice market, which has been led by Ocean Spray, is reflecting slight declined. Regarding the fresh cranberry market, it has been stable and predictable for a number of years and we expect that to continue. It is the sweetened, dried category where we see the most potential over the next couple of years thanks to its versatility. Domestically in the US, we see it used as an ingredient in trail mixes and as a snack and also in salad toppings. Internationally, it continues to enjoy favorable demand in more established markets like Europe and we see large potential in Russia and Asia. Recent years of excess production has seen the market price soften, but due to the decreased numbers this year, indications are pointing to an upward pressure on prices, although we won't know precise figures until we see final numbers." "Decas has brought some new products into the market in response to customer feedback," continued McManama. "Under our Paradise Meadow brand, we have a line of products catering to cooking and baking. There are the julienne cut cranberries which distribute really well in cake and cookie batter. 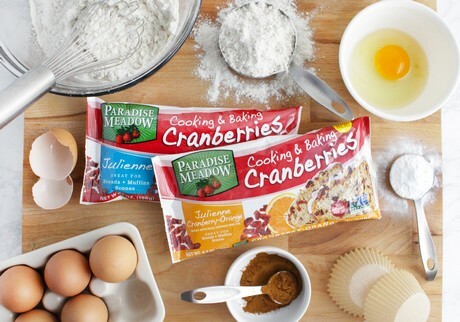 We also have a new cranberry-orange mix that contains orange peel to give a citrus flavor when baking." Cranberry growers have not taken up organic farming in such great numbers compared to other fresh produce items. But that is something growers see potential in, especially when considering the lower Canadian volumes this year, which is where a large portion of organic cranberries are grown. "The organic cranberry market has been underdeveloped, both in fresh and dried, and is emerging right now," added Mauck. "At this time, organic only represents 5% of total volume which is one of the lowest among fresh produce. There is a 3 year transition period for growers and for them, the main strategy is to convert existing acreage into organic, as opposed to developing new acreage. The hub of the increase in organic supplies has been happening in Quebec, but with the large decrease in Canada this year, this will lead to a tight organic market in 2017/18."